We weren't big Halloween revelers growing up. Mostly because it's a day of the Devil!!!!! But now that we're enlightened adults we enjoy the harmless dressing up, candy-gorging, and nephew-adoring activities associated with the day. 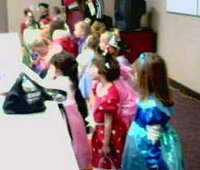 Here are the children who paraded through our office trick-or-treating. By the way if you're looking for interpreter services these kids can recite the alphabet and 1-10 in Spanish. Shouting. "When you wake up feeling old. . . "
Mainstream Media Bias: What Oil for Food Scandal? If you can't get to Camden Yards . . .
"A Man For All Seasons"